When you are making worksheets or tests you most often have multiple questions on each page. You have the freedom to simply click and drag any object to arrange it precisely where you want it on the page. In some cases you may want to align all your objects so they are lined up, look neat and organized, and look professional. This is not a problem. There is an invisible alignment grid built into the Composer Screen. If you set your objects (equations, text, figures, graphs, etc.) to Align, they will only move at the increments specified in the alignment gridï¿½s settings. Right Click on the Object and select Align. Click and Drag objects and you will see it only moves in set increments across the screen. Change your mind? Did you set an object to align to the grid and then decide that isnï¿½t what you wanted? No problem. Select the object by clicking on it. Right Click on the Object and select Align again. The check mark next to Align will disappear and your object is no longer aligned to the grid. Set the specifications of the alignment grid. 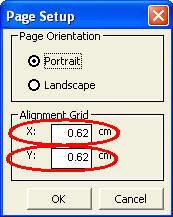 To set the measurements of the alignment grid, from the File Menu, select Page Setup. The Page Setup box will open. Fill in your desired settings in the boxes in the Alignment Grid section.